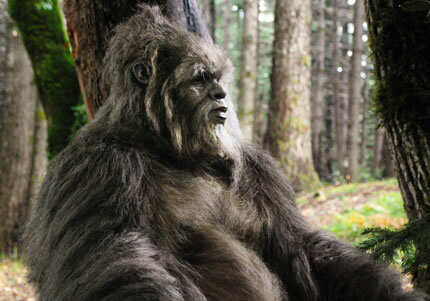 Sasquatches roam the Oregon woods in writer/director Christopher Munch’s Letters from the Big Man, a drama that blends conspiracy theory, environmental concerns and a kind of offbeat romance between one of the big-footed creatures and a young woman working on a stream survey for the U.S. Forest Service. Mind you, it is not a conventional love story, more of a meeting of hearts and minds between sympathetic souls. Lily Rabe’s strong turn as the tale’s prickly heroine and the quiet devotion of “the big man” are what rivets in this low-key and leisurely paced film. Freshly sprung from a bad relationship, Sarah Smith (Rabe) disappears for a solo trip into the fire-scarred forest where she soon can’t shake the feeling that she is being watched and followed. When she meets another solo camper, Sean (Jason Butler Harner), she assumes that it is him, but once the two go their separate ways, she can still feel eyes on her. Only gradually does the truth reveal itself, even then manifesting itself largely through her art work. With the government out to capture one of the Sasquatch in an effort to study and exploit its DNA and various characters making a case for the wisdom of the Big Men (not to mention the philosophical musings of Sarah’s furry friend, relayed to her telepathically), Letters from the Big Man sometimes teeters on the edge of the ridiculous. Rabe is one of the elements that saves it and not just because her performance is so assured, but also because her forthright (however peevish) character demands to be taken seriously.